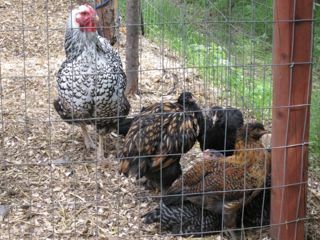 This Wyandotte hen adopted and protected these newly introduced pullets. This is a new blog/website for people who have a small backyard flock, and those who have been thinking about getting birds, especially for eggs, but aren’t sure what they are about to get into. With the growing local food movement, home flocks are increasingly popular, and Alaska is no exception. I often find that people begin with the idea of acquiring chickens to have fresh eggs or meat, but in short order, find themselves surprisingly entertained and satisfied with having a flock. Some (including this author) even get quite attached to their chickens, and discover that having them around is peaceful and grounding – maybe because for so many of us, family farms are in our heritage. At any rate, whether you raise chickens as a source of healthy, local meat, keep them for fresh eggs, or have a couple because your children begged you for those Easter chicks, I hope that you find this site useful. I welcome contributions, photos and questions. This is a growing site, and more will be added as time and interest allows. This entry was posted in General, Information and tagged eggs, hens, rest home, roosters. Bookmark the permalink.